I can fit and remove various chimney caps and cowls. The most common are the bird guard with rain cap. These come in two types, solid fuel and oil or for gas and oil. The difference being the size of the mesh on the bird guard. The different size mesh needs to comply with British Standards. In sum the smaller mesh is for gas and oil, the larger size mesh shown (2cm x 2cm) is for solid fuel or oil. The cappers are for disused flues only. They provide sufficient ventilation to allow air movement through the flue. However, they should never be fitted to an active flue. 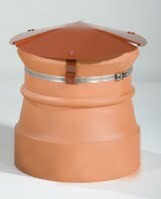 All of the above chimney cowls and caps can be provided square or round to fit the shape of your pot and in either buff or terracotta to match the colour of your chimney pot. 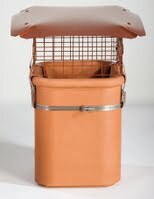 I can also supply and fit a range if antidowndraught cowls, again in either buff or terracotta.